Today we have a guest blogger, Josh Giesbrecht, a high school math and information technology teacher in Abbotsford, BC, Canada. He recently transitioned to teaching from a software development career where he worked primarily in game development. Vector TD is a stylish but standard entry into the tower defense genre of videogames. However, a few specific design features make it stand out as a potential math lesson waiting to happen. Quick intro: Tower defense games are popular in the free web-game space, where they made their big debut as standalone games. The first tower-defense gameplay was created by people making custom maps for real-time strategy games like Starcraft. The TD gameplay is an exercise in resource management. The games consist of a map with some kind of a path from start to finish that the bad guys will try to cross. Your job is to build towers that shoot the waves of bad guys down before they get to their destination. The challenge comes from deciding what to build, where to place it, and (most importantly for our purposes) when to buy it. Before I spoil things any further, go play it. If you have time, try to beat all 50 waves on an easy map; if you’re impatient, at least play for 10 rounds. Or if you want the primer, here’s a short playthrough video of a few rounds. Clearly, math is key when designing and balancing the gameplay for a game like this. Math also comes into play, usually at an intuitive level, for deciding which towers will give them the most bang for their buck. 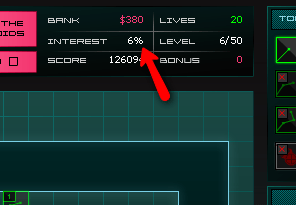 However, Vector TD stands out to me as a potential stealth-math-lesson for another reason: compound interest. If players are stingy and can hoard cash between waves, they earn some amount of interest between waves. Even more importantly, the player is given the choice to allocate scarce bonus points into increasing the interest rate. This isn’t unique to Vector TD; many games in the genre include earned interest, and some also allow you to upgrade your interest rate. 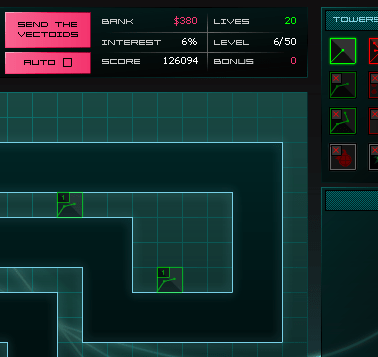 Ironically, the reason I’d suggest Vector TD is that the choices it presents aren’t well-balanced. So this game makes compound interest look pretty attractive, and may even help kids catch onto the value in delayed gratification (maybe). So how do we connect it to the classroom? This isn’t an “edugame”; it doesn’t dive straight into teaching interest rates and doesn’t ask students to actually work out any numerical solutions. In-class Activity: Here, you could take advantage of cooperative learning and play, letting students who aren’t as game-literate work together with others and get the hang of the basics. The mixed advantage/temptation would also be that you can observe and interact with the students, but try to keep it to a minimum. Don’t be too helpful. Just tell students this is an exercise in finding logic and math in a fun game, ask them to figure out how to beat all 50 waves, and then discuss the winning strategies at the end. The biggest problem: this game takes a while to complete, even if you already know how to beat it. It may take students two or more hours to get enough experimentation under their belt to pull out the “good stuff” on their own. Homework Assignment: Give students the task of playing and beating the game on their own time. At a secondary level, this has the danger of parental incredulity (“That’s not homework!”) and student abuse (playing it for longer than needed, neglecting other tasks and blaming the teacher). It may also be tricky to account for differing levels of game-literacy in students; some may be completely disengaged or overwhelmed by the task. Still, a big advantage here is that it could be assigned as a long-term task, something due in a week or two rather than next class. This gives students the space to play and discover things on their own. Thanks Josh, for a great post about Play and Learning. You can find Josh on twitter @joshgiesbrecht or visit his blog, Josh G’s Notes. If you’ve got a game that you think would provide good play for learning, and you’d like to write a guest post, send me an email with your idea. PreviousLost Pointer in Tablet Projection? NextDigital Decluttering: Sort those files!